A lot of us choose to fast during the nine days of navratras. Navratri is generally celebrated twice a year. Once during the spring and the other during the onset of autumn, which is why the one celebrated during this time of the year is also known as Chaitra Navratri and the one that is celebrated during the latter half of the year is known as Sharad Navratri. While some people choose to abstain from non-vegetarian food and alcohol during these nine days the others are forced to do the same, like my husband :p…(I am probably going to get killed for putting this down). Nonetheless, I love him for doing this solely for the faith I have in God (butter butter butter!!!). Every year I generally fast for two days out of nine but this year I have chosen to fast for all eight days, The Eighth day because we celebrate ashtmi (the eighth day) instead of the navmi (the ninth day). Since most of us are confused about what to cook for a meal during these days, I thought of sharing what I cooked for myself last night. It was the sabudana (sago) kheer. So the sabudana was soaked in warm water for three to four hours. Ideally one should soak it overnight but since the idea of cooking the kheer came to me during the afternoon I had only couple of hours on my hand. During the evening while the sabudana was still soaking in the water, I put some milk in the pan and waited for it to come to a boil. Meanwhile I chopped some almonds and walnuts and raisins to add some richness to the simple kheer. Once the milk began to boil I added a few crushed elaichi (cardamom) seeds and dropped in the chopped dry fruits. I drained the sabutdana and added it to the milk. I then reduced the flame and left the milk to boil, stirring it every now and then till the milk thickened. Then, I added sugar to it and gave it another good boil. And it was ready! It looked perfect with the nuts and the translucent jelly like pearls. Since I like my kheer chilled, I waited for it to cool down a bit and then put it in the freezer for half an hour. And after exactly thirty minutes the yummy went into my tummy *SLURP*. The raisins were fat and succulent and all that boiling helped the flavour of nuts to come out really well with the goodness of milk. Now if you are fasting and are confused about what to cook for a meal tonight try this. -Soak the sabudana overnight in water or for 3-4 hours in warm water. -Pour four cups of milk in deep bottom pan and let it come to a boil. -Chop the almonds, walnuts and raisins roughly. -Add the chopped dry fruits (leaving just a few for the garnish) and the crushed cardamom seeds to the boiling milk and reduce the flame. -Drain the sabudana and add it to the milk. -Let the milk boil. Stir it every now and then. -When the milk begins to thicken add sugar to it. -Give it one final boil and take the pan off the flame. -Transfer the kheer to a bowl. -Garnish with the remaining chopped dry fruits. You can serve it hot or if you like it chilled wait for its temperature to come down a little and put it in the refrigerator for some time. -Soak the sabudana in enough water. Take one pearl between your thumb and index finger. If it mashes easily, it is done. -You can also blanch the nuts earlier and then add it to the kheer. -Three cups of whole milk and one cup of low fat milk can be used and white sugar can be substituted with brown one for a healthier kheer. -If not fasting you can soak a few saffron strands in warm water and add this to the kheer to add some colour and flavour. P.S. 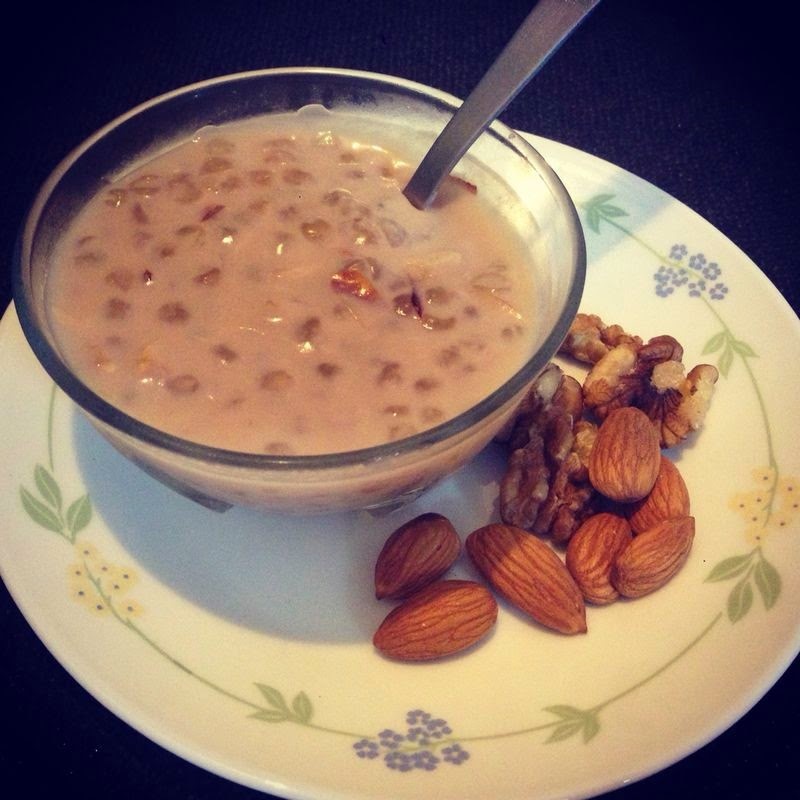 : I tried adding walnuts to a kheer for the first time and I ABSOLUTLELY loved it! thank you aparna :)...try it if you are fasting and let me know how it turned out..